Shaenon: Hey, a party! 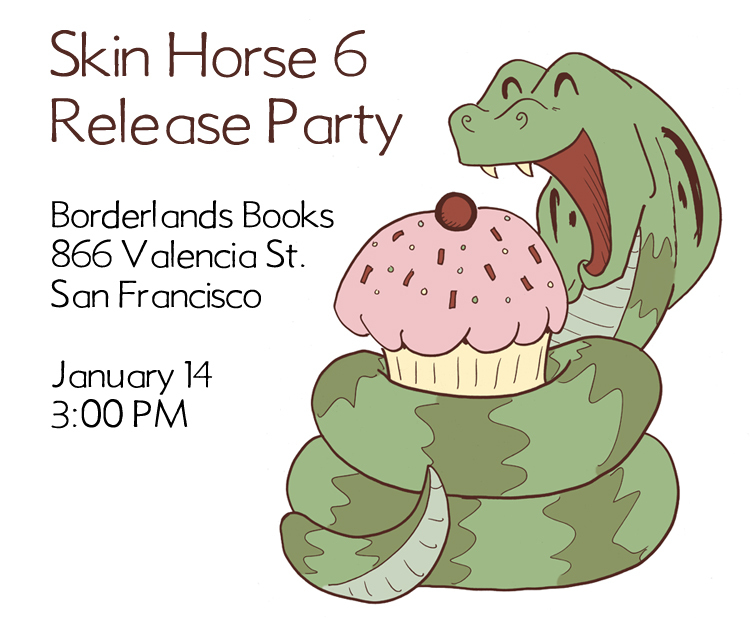 I’m throwing a book release party for Skin Horse Volume 6 at the wonderful Borderlands Books in San Francisco on Saturday, January 14. Expect books, cupcakes, and wine. Channing: Man, I was at this thing a few years ago and it was rad. If you, unlike me, are anywhere nearby, check this thing out. Enjoy dawdling in the Borderlands, but watch out for the shelf elves. OMG! I’m finally first! and for one of my more inane comments! Sorry, I have LARP then. Also, I’m in Chicago. Well, it’s been a long time coming but it’s finally here. Ooh! Ooh! Ooh! I know that place! Yay! I can actually attend something! I’ll see if I can make it up there from LA—yay Borderlands! Hey Shaenon, I just got a very suspicious looking e-mail from you. You might want to check to see if you’ve been compromised. Jeff, you’re about twice as nearby as I am.